Let’s chat. How are your fitness goals going so far? Be honest. It’s still January so hopefully you’re still feeling motivated and excited about working out. But if things are slowing down, I’m here to hopefully help! I’ve said this before and I’ll say it again – I use to hate working out. And part of that was because I felt very uncomfortable in a gym. I felt lost, I felt judged, and I didn’t really know where to start when I walked in. So instead of giving up on those goals of getting into better shape, I created my own gym. I started working out at home and running on a regular basis. And the more I did this, the stronger I got and the more confident I felt. And one of the best parts about working out at home is that it can be incredibly affordable. Not only are your saving on gym fees, but you can get amazing workouts in with minimal equipment. When I started working out on my own at my home, I was a sophomore in college and obviously pretty broke. So instead of buying expensive equipment like multiple pairs of dumbbells, kettlebells or other bulky pieces, I turned to resistance bands that I found at Walmart, which was something I could definitely fit in to my budget. And with that first set of resistance bands, my whole life changed. I started seeing muscle definition, I started getting stronger, and because of that, I found myself finally seeing some confidence I never had before. And confidence is life changing. Confidence not only helps you walk with your head held higher, but it gets you excited to create an even healthier life for yourself and your family. With that first set of resistance bands, I found myself trying new workouts, trying new foods, and setting myself up for a successful, productive and healthier life ahead. But resistance bands aren’t the only way to get in shape! There are tons of other pieces of equipment that are affordable and packable, which means you can take them anywhere! And one of my favorite FAVORITE pieces of equipment that I take everywhere with me is a jump rope. Jumping rope is one of the best total-body workouts that you can do almost anywhere. I shared an instagram video this week talking about some of the benefits to jumping rope. Not only are you going to burn a ton of calories, but you’ll also improve coordination, cognitive function, AND bone density! And I got my own jump rope for just $7.99!! You cut the jump rope to your own perfect length and then all you gotta do is start jumping! It could not be simpler than that! Sure, it may take a little getting use to if you haven’t jumped since you were a kid, but aren’t all workouts a little foreign at some point?? Another affordable piece of equipment that’s incredibly versatile is a pair of sliding discs. These simple little discs are great for wood floors or carpet which means they are great for workouts at home. And they are only $9.99! They create a low to no-impact workout that is easy on the joints. And with the sliding discs, you have to maintain constant tension in the muscles, so you’re working main muscle groups along with stabilizers, which are so important long term. And since you’re constantly performing concentric and eccentric muscle contractions, you’re also improving balance along with muscle growth! And last but not least, one of my favorite pieces of equipment as of this year are the handy dandy loop bands that have been so popular on social media lately. These bands are incredibly portable so you can take them absolutely anywhere. And they are perfect for any fitness level, from novice to expert. Something I love about loop bands other than being able to strengthen muscles, is the fact they strengthen all the tiny muscles that sometimes get overlooked. Plus they can help add extra resistance when doing other movements like lifting or sprint drills! If you’re looking for the best affordable equipment on the market, Walmart has EVERYTHING! From resistance bands to ladders for drills to slam balls for a full body workout, they seriously have all kinds of exercise equipment to help you stay fit this year! And they make it easy to set a price, shop by customer rating, or search by which items are available for free pick-up, so you can find exactly what you need in seconds! Plus they even have supplements and self-care products to keep you feeling your best, day after day. And they even offer free shipping on order $35+! And if you’re still feeling a little lost at what to do with all this equipment, I’m going to share a quick recap of my favorite movements. That way all you have to do is google them if you’ve never heard of them! That’s exactly how I got started myself when I bought my first set of resistance bands! If you don’t have the budget for a gym membership right now or you simply don’t want one, not to worry! You don’t need it! All you need is a little motivation, a little creativity and a lot of good music. 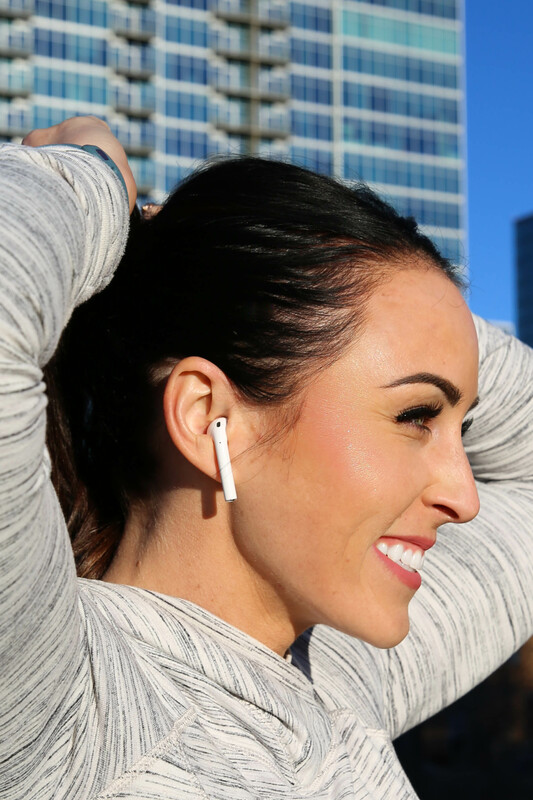 And with all the money you’ll save from not having a gym membership, you can put that into a pair of good headphones like the Apple Airpods or even a smartwatch like the FitBit Versa! 2019 is your year. This is the year that you can take control of your own health and create a better future for yourself and your family. It just takes one simple step at a time. Now go out and prove to yourself that you capable of so much more than you thought. This year is going to be a great one, I can feel it. Thanks for the tips! I only workout at home now since I have two toddlers that demand a lot of time. Quick question, did you first count your calories when you started your fitness journey? Or just went paleo and watched portions? i tried the zone diet when i first kicked off my fitness journey. it’s not counting calories but it helps with portion control for sure! it was very eye opening in to how much i was overeating before! Hi Juli – love this post, but all of the hyperlinks throughout just take me to the Walmart homepage, not to the actual products you discuss. Is there a way to know which brands you have from there? i’ve checked and rechecked all the links and can’t seem to recreate that issue. can you tell me what browser you’re using?